The LP CSIC/UAB is located at the Medicine Facultry Building in the Barcelona Autonomous University (UAB) Campus. 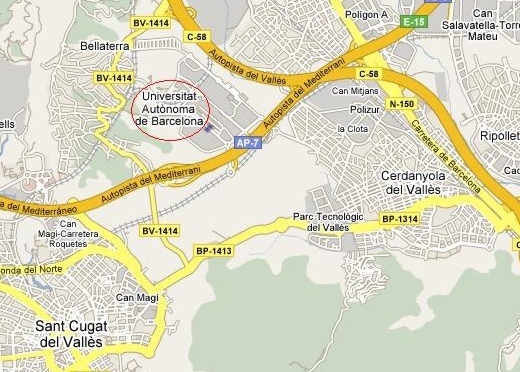 The UAB central Campus is located at Bellaterra (Cerdanyola del Vallès), 20 km from Barcelona, between Sabadell and Sant Cugat del Vallès. Barcelona/Sabadell (S2) railway station Universitat Autònoma. Departure stations in Barcelona city are: Catalunya, Provença, Gràcia, Muntaner y Sarrià; also other departure stations at the other end of the line are: Sant Cugat, Sant Quirze y Sabadell. This track is connected in Sant Cugat with the S1 that goes to Terrassa and Rubí. All the trains going to/from Sabadell, UAB or Barcelona stop at the UAB station. The trip from Barcelona to UAB takes about 30 min. Trains depart every 10 minutes aproximately. Time-tables can be checked by phone 93 205 15 15 o in FGC web. Railway R4, estation Cerdanyola Universitat. Departure stations in Barcelona are: Sants, Plaça Catalunya, Arc del Triomf y Sant Andreu Arenal. The trip takes about 30 minutes. Groups of more than 10 adults have a 40% discount. Time-tables can be checked on 93 490 02 02 or in RENFE web. From the UAB railway station there is a free shuttle bus service that connects the station with the different buildings in the Campus.